Warm the water and add the yeast and a tsp of sugar to it. Leave it untouched for ten mins. Then mix well till the yeast dissolves. Combine the flour, powdered sugar, salt, vanilla essence, milk and the yeast mixture together and knead into a soft dough. Bring the butter to room temperature and mix it to the dough and knead again till the dough is smooth and elastic. Place the dough in a bowl and cover with cling film. Leave it untouched until it doubles. It would take around 20-40 mins. Press the dough lightly to remove air and knead softly. Now roll out the dough to 1/4" thickness on a well floured surface. Use cutter and cut out the desired shape and leave them on floured butter paper for another ten mins until it doubles again. Heat oil in a pan. Carefully lift the dough rings and fry them in hot oil on medium flame till golden brown in color. Powder cinnamon and mix it with some caster sugar. Spread this on a plate and dip the doughnut in it until it gets coated with sugar on all the sides. Take few tsps of icing sugar in a bowl and add desired food color to it. Add just a few drops of water to it and mix well till it forms a paste. Fill this in a paper cone and draw desired designs on the doughnut or simply drizzle it over the doughnut. Mix all the ingredients in a bowl and see to that it doesn't form lumps. The tickness of the glaze is upto you. You can adjust the quantity of milk to make it thick. 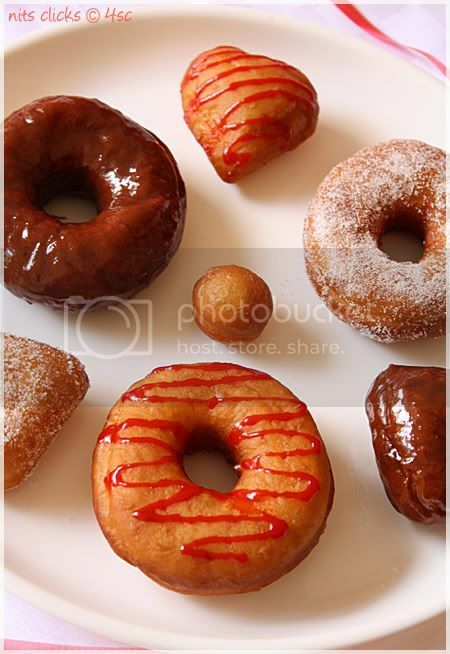 Dip the doughnuts in the glaze and allow it to set for 10 mins. I'm also sending this to "Food palette series" - Brown. 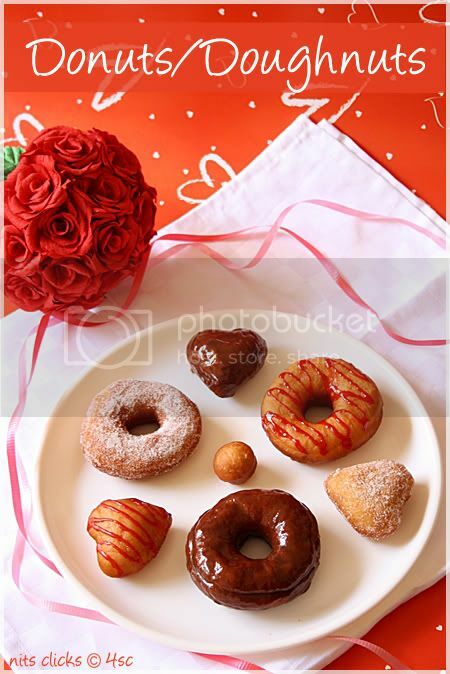 Lovely eggless donuts and perfect for Valentine's Day! Wow, what a pretty looking post and such perfect doughnuts. 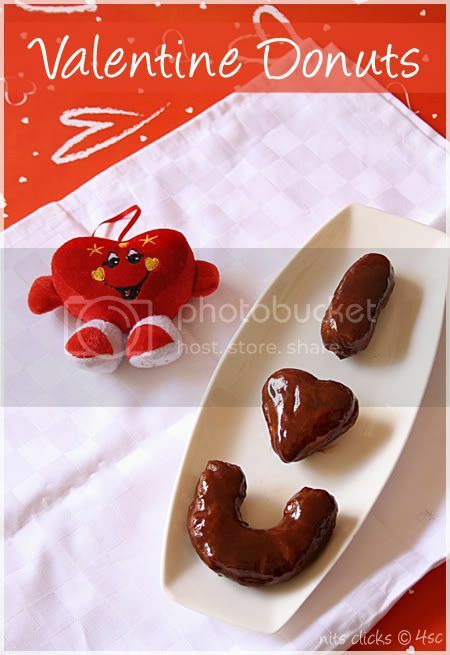 Sure the invisible man will be happy to see all such goodies when u find him :) Happy Valentines Day Nithi!! 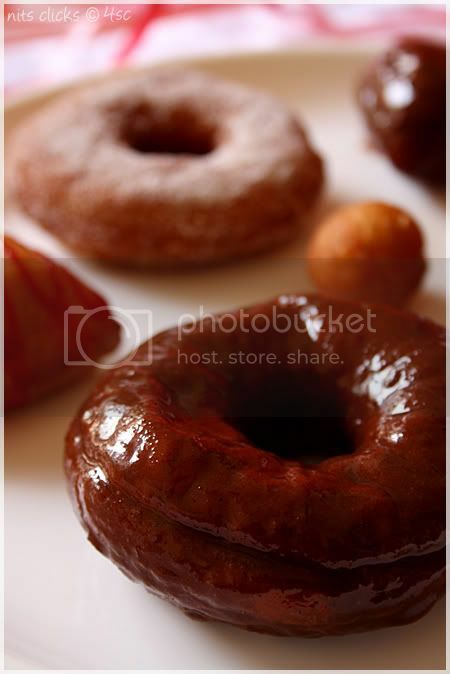 Yummy looking doughnuts....beautiful clicks as usual esp the 1st one!! eggless version.Sure will try it. 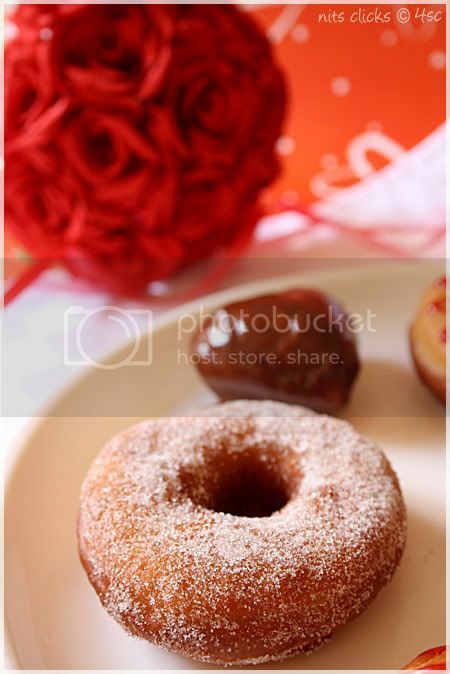 Wow so lovely doughnuts..and such wonderful pictures..wishing u a happy valentine's day. Wow!!! 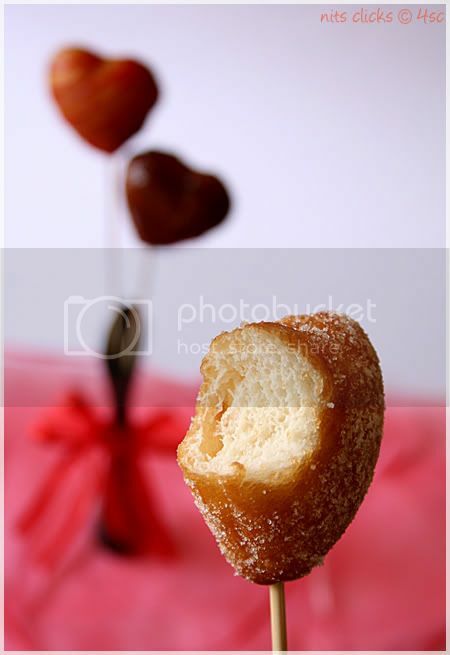 such a drool worthy and tempting dounut.. feellike eating it right away...Nice click..
omg-- it looks awesome ! and whoever the man u r destined for is for sure lucky to have you ! Wishing u all the love in the world ! 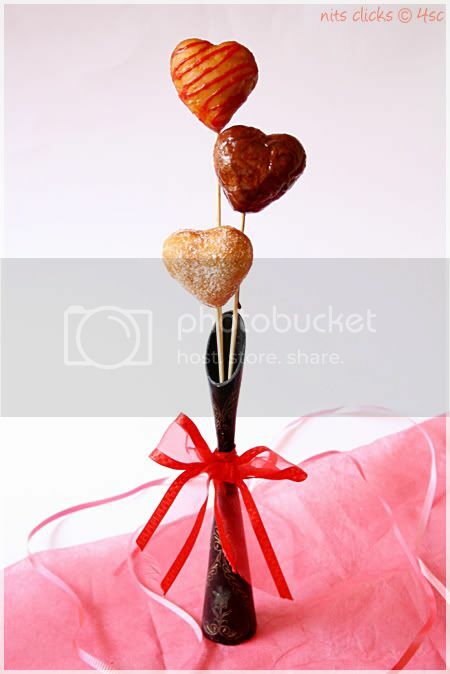 Looks absolutely perfect for Vday..
Ooh-la-la..you made those at home..way to go! !Looks so cute!! and yeah,the invisible man better make his appearance soon..look what he's missing!! Cute pic nitts..!! and hope the lucky man is seen as soon as possible..happy valentines..to you !! Wow the donuts are looking lovely as you are my dear :) I only wish I was that invisible lad ;) May be atleast in my next birth.... Leaving that aside, the heart shaped donuts are soooo cute and they look so yummy and delicious.Great work!!! Donuts are loo,king awesome. Happy VDay. You will find ur invisible man very very soon Nithi. Sure he will enjoy seeing this post and will ask you to make this little cute donuts. Everything looks cute and wish you good luck !!! Lovely doughnuts and lucky invisible man....Happy Valentines day!! looks awesome..hats off ur creativity..nice clicks!! The way I see it, Valentine's Day is just another great opportunity to tell the people you love how much they mean to you. But keeping out the commercialism is important. 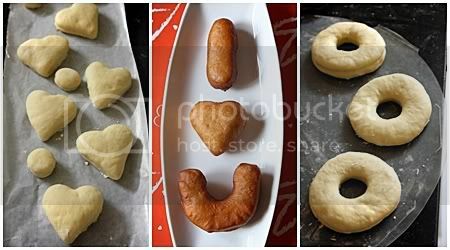 Omg, those eggless donuts looks pretty,marvellous and truly awesome..;Happy Valentine's day Nithya..
cute and perfectly lovely doughnuts. Nithya, you make everything perfect and wonderful. 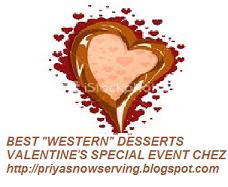 Loved the heart donuts.. Happy Valentine's day! First time here....lovely blog...the heart shapes are adorable. 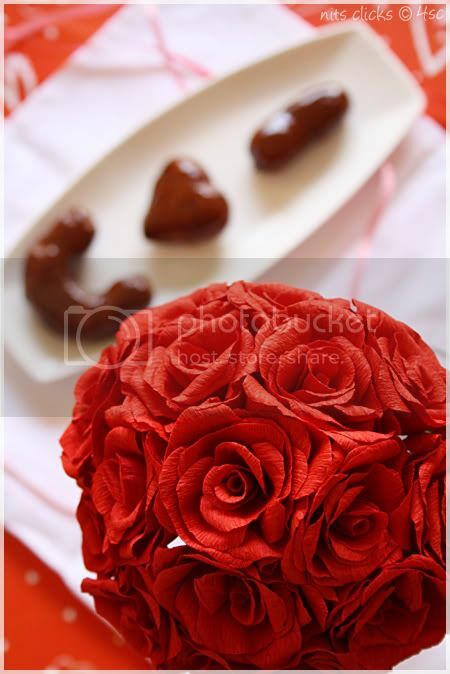 Happy Valentine's day to you, Nithya..Fabulous clicks!! Really appreciate your photography skills..
Amazing ...am motivated to try tis one will bookmark n let u know wen am don with it.. The preparation is very good. You can be selected as the interior decorator for small, middle and big budget projects. The presentation was really good Nithya. Absolutely gorgeous... Love ur clicks! Hi! I'm new to your blog and I saw it only after reading Indulge this morning! I tried your doughnuts right away...they were DELICIOUS...my entire family(which consist of 10 people,I live in a joint family)simply loved them!!! 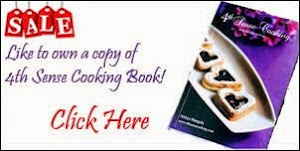 I am going to try some other recipes,and thank you sooo much for this great recipie! Thank you for sharing. Just tried this recipe, it's amazing and so simple. I let the dough rise for 90 minutes, and it worked out great. Also worth going the extra mile to source the fresh yeast. Thank you!